When I think of salad, I think of author and food revolutionary Alice Waters and this quote from her book, The Art of Simple Food. This salad really brings that quote to life for me. I enjoy preparing the fresh, colorful ingredients, and I definitely love devouring it. 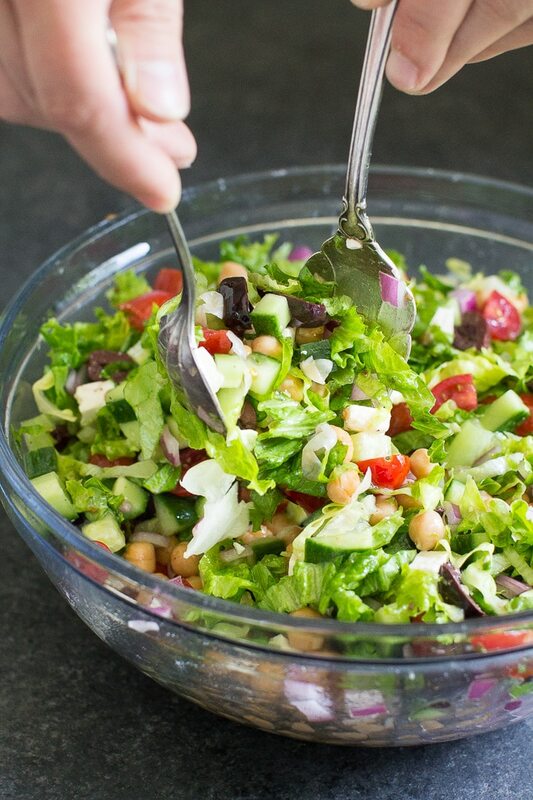 It’s the kind of salad that can convert a person into a full-blown Salad Lover. 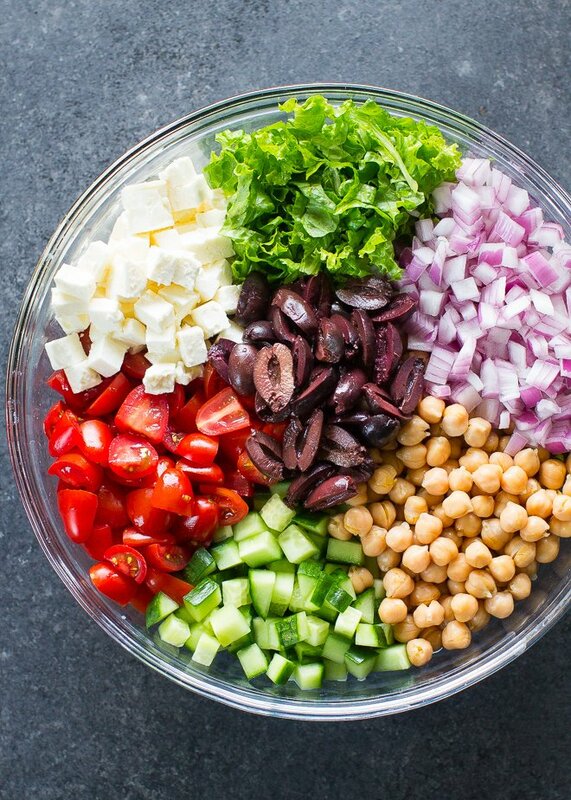 To make my Mediterranean Chopped Salad, I chose my favorite Greek Salad flavors, added a pile of lettuce, and tossed in some chickpeas. Everything is bite-sized, exactly as a chopped salad should be. I use Persian cucumbers exclusively these days because they taste like I just picked them from my garden (which if you read this post, you know I don’t have). The skins are thin, the seeds are tiny and sweet, and they are just perfect. If you can’t find Persian cucumbers, Japanese cucumbers are quite similar (although possibly harder to find). Hot house cucumbers (the long, slender ones wrapped in plastic) are the next best thing. If you have to resort to a regular grocery store cucumber (those make me sad), the best thing you can do is peel it, slice it in half lengthwise, scrape the seeds out with a spoon, and chop it. This is my go-to salad dressing these days. Since I can whip it up in 2 minutes with 5 pantry ingredients, why wouldn’t I? It’s easy, healthy, and enhances fresh vegetables without weighing them down. Just give everything a toss and you’re ready to feast! 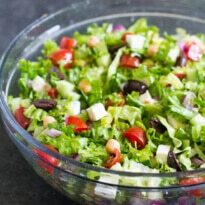 This Mediterranean Chopped Salad makes a fantastic lunch (feel free to layer it in jars if you’re into that sort of thing) or serve it with all the grilled meats of summer. 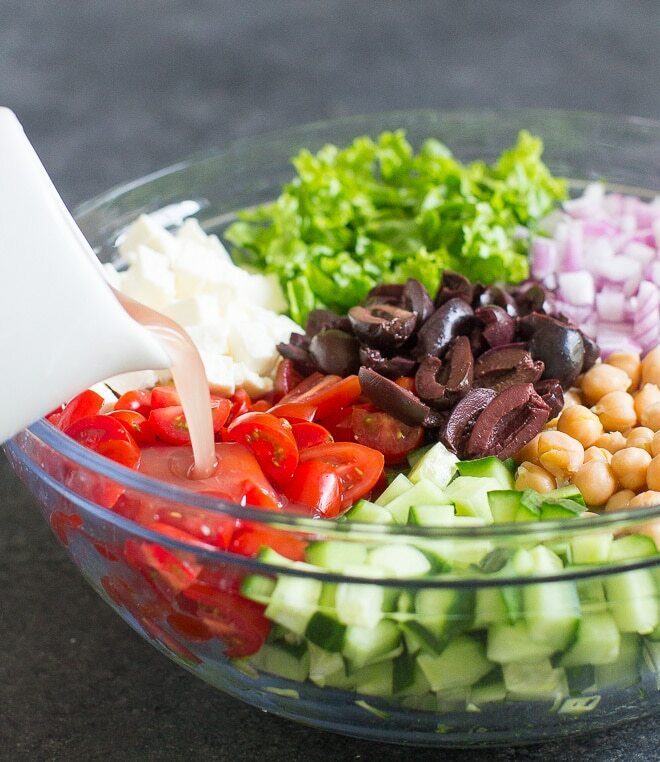 Save this Mediterranean Chopped Salad to your “Side Dishes” Pinterest board!